Most people need a charitable reason to inspire them to run a marathon. For 235 out of the record number of 40,000 runners at this year’s London marathon, that reason was Parkinson’s. British charity Parkinson’s UK fielded a team who were running for a cause close to their hearts. At the end of the day, they raised an amazing total of £321,000 for Parkinson’s research. But how did Team Parkinson’s UK fare before, during and after the race, which featured a surprise appearance from members of the royal family? Paul Jackson-Clark, director of fundraising at Parkinson’s UK, posted a video thanking all of those taking part in the event on behalf of the charity. Before the race, Parkinson’s UK staff enthusiastically decked themselves out in blue – including blue lipstick – to show their support for the runners. A cheering section was set up in Greenwich, South London, to urge on those running for Parkinson’s when the going got tough. Stationed at the 19-mile mark, another team of supporters cheered on runners for the final seven miles. Photographer Mike Garnell shared his best shots of the event. As ever there were a few famous faces getting involved and showing their support for Parkinson’s UK. The Duke and Duchess of Cambridge, along with Prince Harry, shared high fives and hugs with those taking part. In this short, humorous video English comedian Rob Deering, who was running the race, explains his personal connection with the condition. Sky Sports presenter Dave Clarke, who has Parkinson’s, took time to thank all those raising money for the charity. Men’s Fitness magazine editor Joe Warner was among those running for Parkinson’s UK. As the weekend drew to a close, the Parkinson’s community praised those taking part for their efforts. A special reception was held to thank the Parkinson’s UK runners for all of their hard work. Parkinson’s campaigner Emma Lawton, who is vlogging about her condition as part of the PD365 project, expressed gratitude to those participating on behalf of Parkinson’s UK. After such a successful event, plans are already in place for the London marathon 2018. A wealth of applications have been submitted. 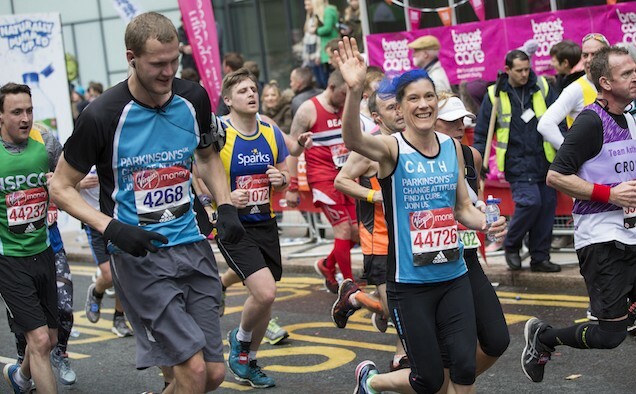 Runners are aiming to raise money for Parkinson’s UK next year, you can get involved here.